A first date that ends in death is probably the worst case scenario for anyone. That’s particularly true for Melati, an endangered Sumatran tiger who was killed by her mate-to-be last Friday at the London Zoo. It’s easy to get swept up and place blame, but despite the violent loss of a beautiful animal it bears repeating that zoos remain important centers of research, education, and preservation. 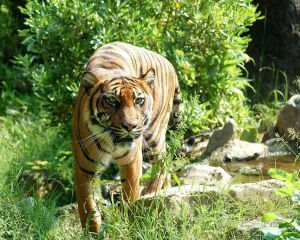 The ZSL London Zoo where Melati resided is a part of an important breeding program which aims to help repopulate a number of endangered species, like Sumatran tigers. If you’ve ever introduced two cats to one another, you can imagine how dangerous it is to introduce larger animals, let alone two big cats. In fact, introductions gone wrong are not that uncommon. The animal handlers at London Zoo planned carefully, observing interactions between Melati and Asim, her tiger partner-to-be. Despite all indications things would go well, Asim’s behavior took a turn for the worst. In a statement the zoo explained its staff did everything they could to separate the two animals and prevent them from harming one another, but they weren’t able to intervene. “Everyone at ZSL London Zoo is devastated by the loss of Melati, and we are heartbroken by this turn of events,” the zoo added. While the death of Melati may be an unfortunate accident, the past year has already seen a number of high-profile incidents involving or alleging the mistreatment of animals in the name of science, from monkeys cloned to have faulty DNA to animals with disturbing genetic mutations. It’s important to identify such instances of mistreatment and separate them from accidents. The involvement of zoos and researchers in the lives of animals can lead to good too, like AI-assisted conservation programs and novel in vitro fertilization solutions to reproduction which help sustain populations. With many conservation efforts having little legal ground work, and some existing litigation being removed, scientific efforts to save species are more important than ever before.